Android Nougat 7.1 ROM, Galaxy S5 VERIZON Lineage OS 14.1 has now arrived via an UNOFFICIAL build. If you want some more Lineage ROMs or wanna taste the OFFICIAL Lineage build then stay tuned the Lineage OS 14.1 ROM collection page. Before this there was the CM14.1 for Galaxy S5 VERIZON. 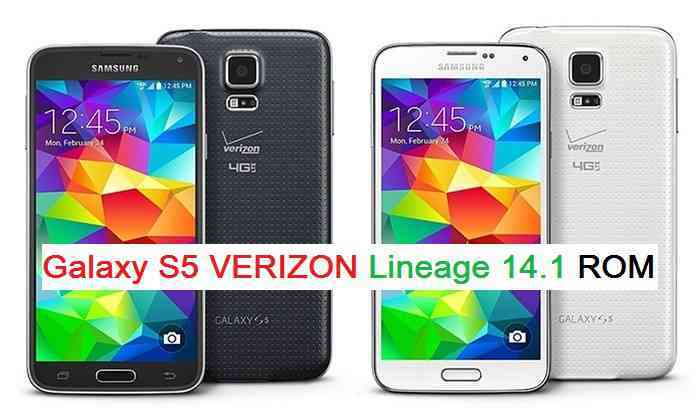 This Lineage 14.1 for Galaxy S5 VERIZON (kltevzw) is brought to you by developer Xecht. THIS IS AN INITIAL BUILD WHICH MAY NOT BOOT AT ALL. HAVE A BACKUP BEFORE FLASHING THIS AND TRY AT YOUR OWN RISK. Installing a custom ROM on a Galaxy S5 VERIZON (kltevzw) requires the bootloader to be unlocked on the Galaxy S5 VERIZON (kltevzw) phone, which may VOID your warranty and may delete all your data. Before proceeding further you may consider backup all data on the phone. You are the only person doing changes to your phone and I cannot be held responsible for the mistakes done by you. Download and Copy the GApps and Galaxy S5 VERIZON Lineage 14.1 ROM ZIP to your phone. First flash the Galaxy S5 VERIZON Lineage 14.1 ROM ZIP from device. Then flash the GApps zip from your device memory. Reboot and Enjoy the Nougat 7.1 Lineage 14.1 ROM for Galaxy S5 VERIZON (kltevzw). Copy the latest Galaxy S5 VERIZON Lineage 14.1 ROM ZIP file to your phone. Stay tuned or Subscribe to the Galaxy S5 VERIZON (kltevzw) forum For other Android Nougat ROMs, Lineage OS 14.1 ROMs, other ROMs and all other device specific topics. 1. Do you mean we shouldn’t use it to import apps/data from a previous ROM? 2. Is there another backup program that will work better so that when I upgrade the ROM to your next release, it will be easier to migrate apps/data? The reason being it may break the system after installing the Apps and data from the older Android version. Now a days most of the application developers design their apps to store the user data in cloud. If not such as WhatsApps: most of the images and files are stored on SDcard and all the messages (even the multimedia files too) can be backed up to the SD card or pushed to Google Drive or Dropbox etc. In anyway when you are upgrading an Android version it is strongly recommended to take a backup of the current phone data so that you just need to copy it into the new ROM after upgrading.